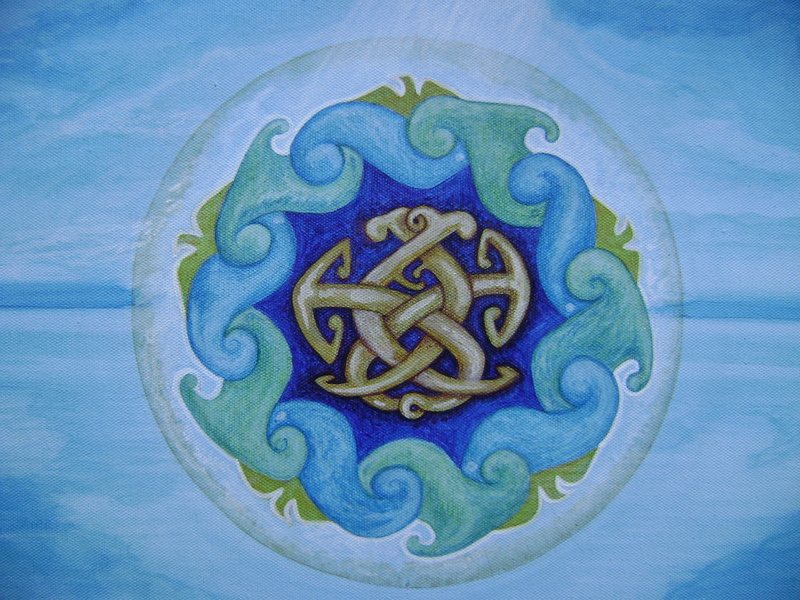 Anasera is painting… the first of the Wildersoul Circles. 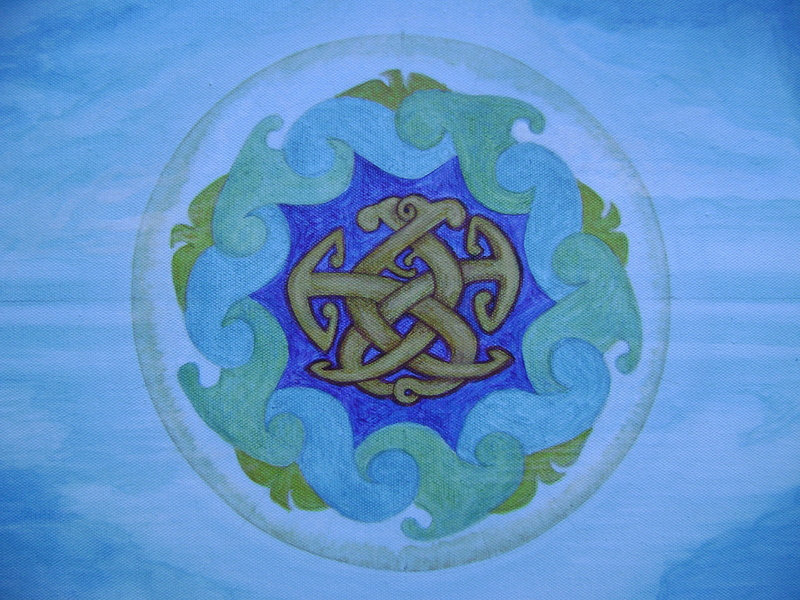 The initial design for this painting was scrawled on a tiny notepad roughly, and enlarged using my eye to measure the circle into fifths. You can see the scanned version in my previous post. 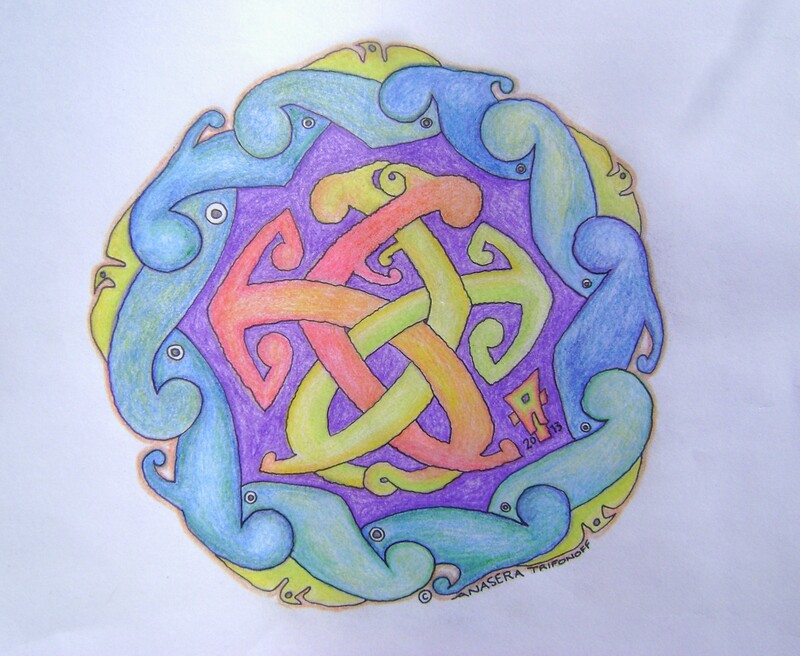 Here’s what it looks like coloured in with pencils, and ink pen. This is the canvas, pre-primed and ready to go. I measured it all up with a protractor, and ruler. Took me a while to get my maths straight! It all adds up to 360! Except if you have a bump on your head! 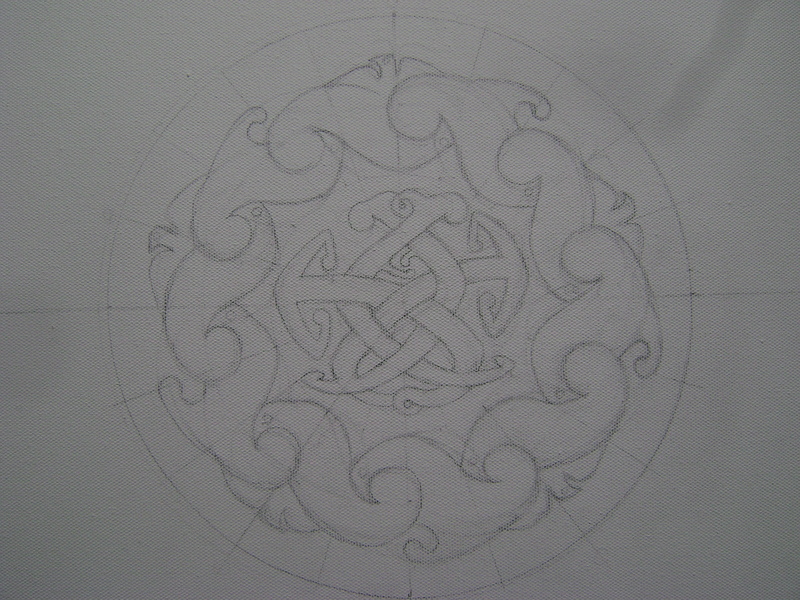 And there’s the central design… It is kind of half Celtic knot and half Maori art. 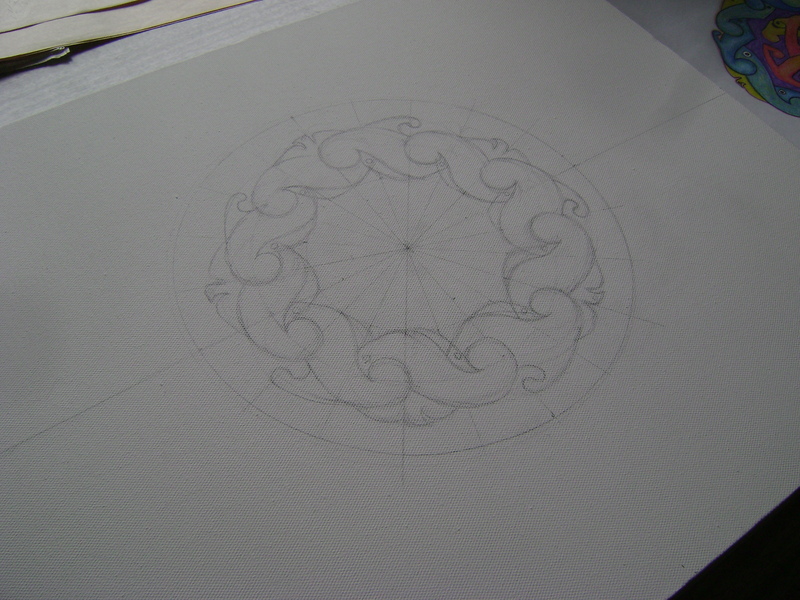 Now to start colouring in… with paint! 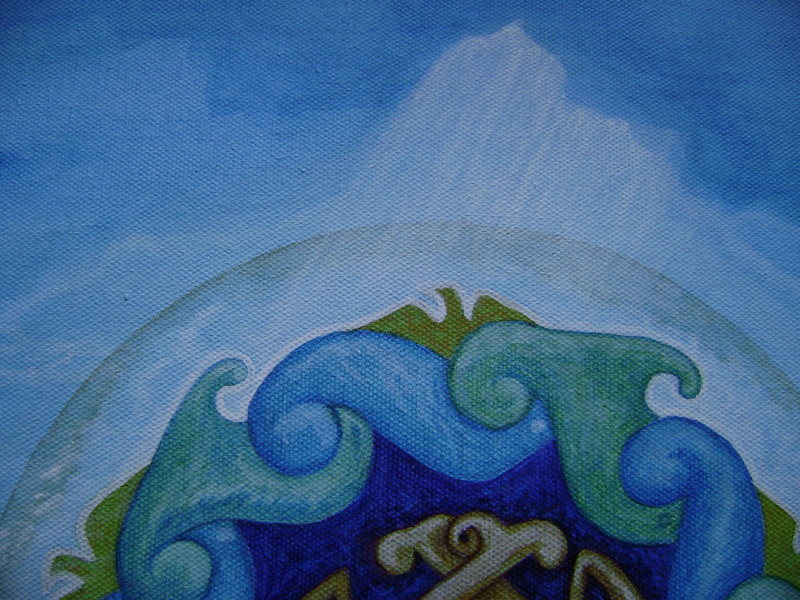 It has been such a long time since I painted, and I haven’t really ever done detailed precise work. My usual love is expressive and gestural, with heaps of texture, and the use of strange and unusual painting implements; like fingers or bits of tree. There’s the background. 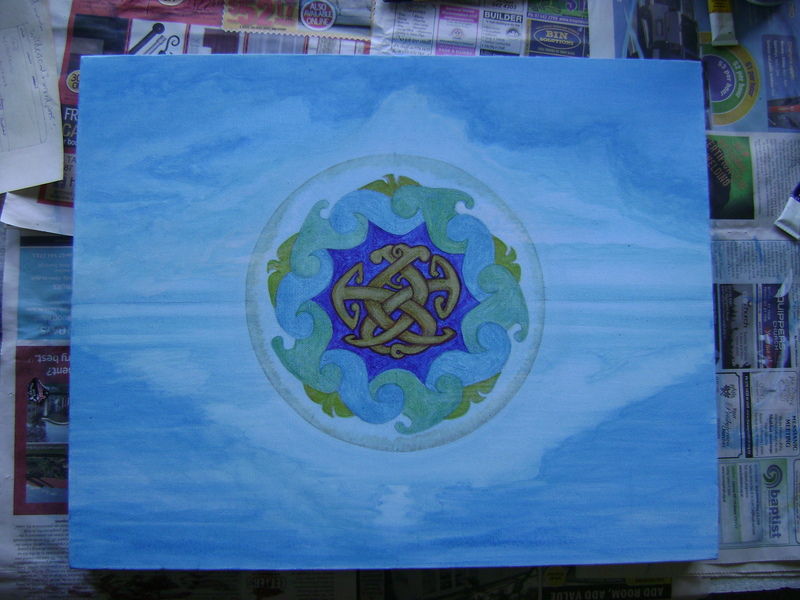 I covered it entirely with Pthalo blue. Can you say ‘pthalo?’ It always makes me laugh and think of Snagglepuss. Okay, here it is on the dining table which I covered with newspaper. (Mostly so I can blot my brushes on it.) I did a quick tiny sketch of the background photograph from yesterday’s post, to work out how I wanted the composition. 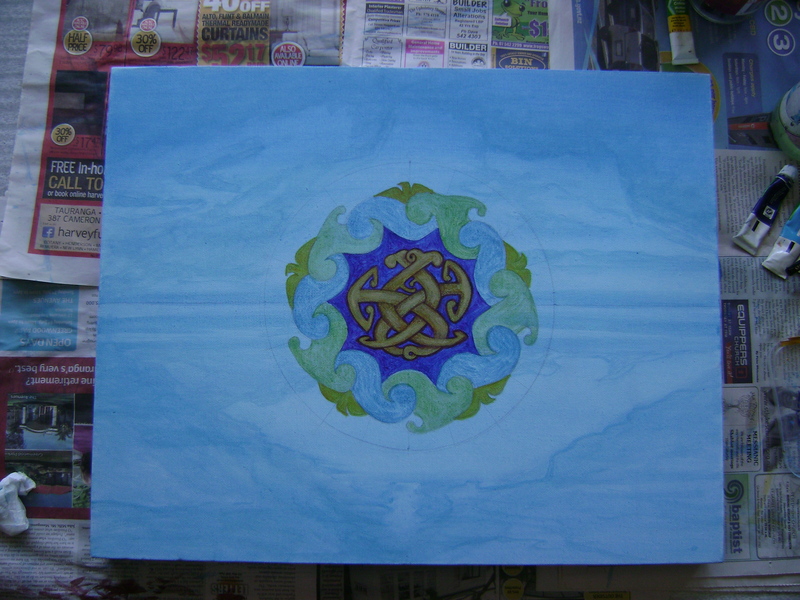 Then transferred the major light and dark areas to the painting background. That’s a close up. You can see the pencil line circling around the entire design. I wanted to have some sort of glow like I did with the digital version. And took a while to figure out what might work. White paint wouldn’t block out the pencil marks! I decided on yellow ochre, and really lightly painted exactly up to the pencil line, and blurred it back toward the centre with a dry brush. I added some detail into the clouds. Here’s a close up. 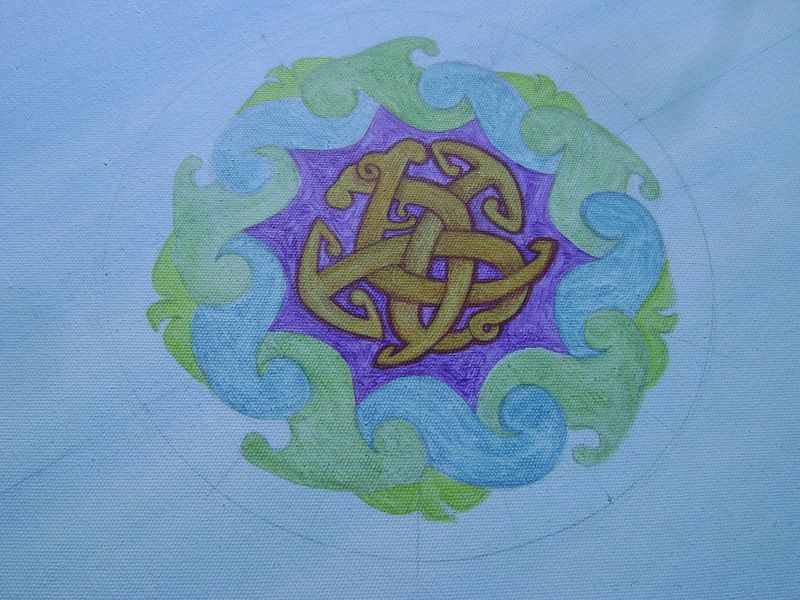 I painted some white into the outer circle too. Just kind of scribbled it in. Trying to get the design to ‘pop out’ of the background a bit. This is pretty much how it looks now. I am not sure what to do next. 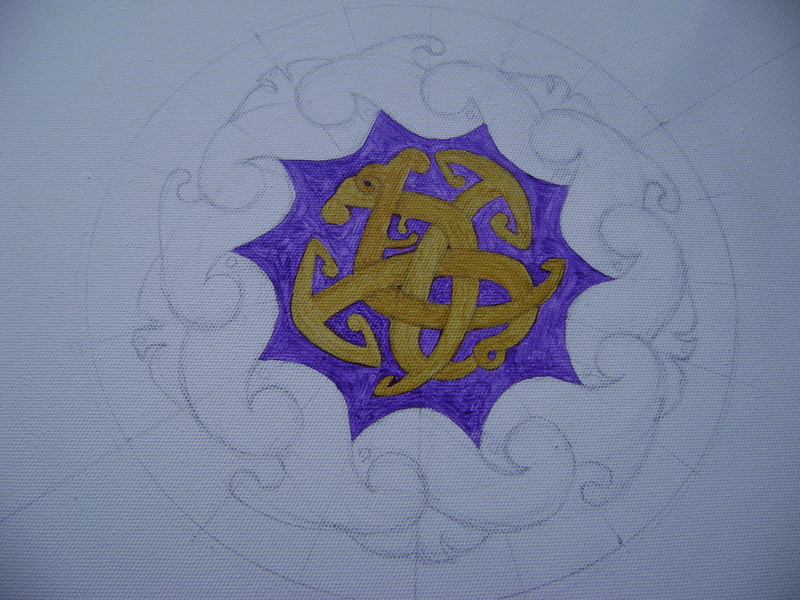 I added layers of pthalo blue to the purple centre, and worked up the lights and darks in the central knot. 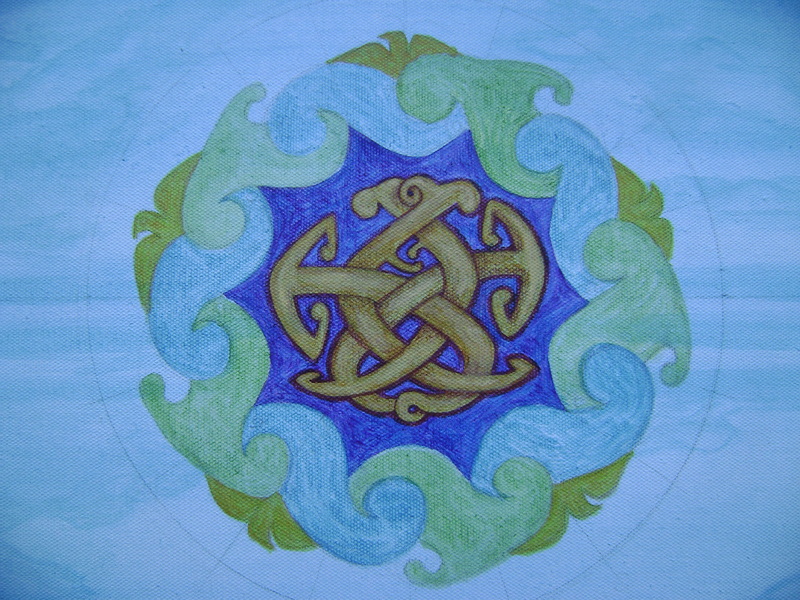 Then added blue and white to the outside design, which I will call waves, although a friend reckoned they looked like dolphins. I’m curious now, what do you think they look like? Here’s a close up. When I go and look at it on the table, it feels like someone else painted it; not me! It’s a strange feeling, and I don’t want to wreck it by doing any more. I have spent eight hours on it so far. Close up of the light shining on the bird. I have twelve designs on my tiny sketchpad. The next one is ready to scan in. I want to take one-fifth and copy and paste it around a circle. Hopefully this may save time on drawing it up! Maybe it will be easy to transfer direct from a printout on to canvas too. That will save time, too. What do you think of the painting? Bit different? It would be incredibly funny if that happened in real life, although highly unlikely. Haha! Me, a barmaid! Who would’ve thought! Hmm… thinking caps on, all right! My brain is melting! Oh, I see… a bit like Trenton’s cabbages?? I had never heard of such a thing that I can remember but I’ve just googled it and low and behold there is such a thing here! Who knew?! There used to be a printing shop near me too that did menus, party invites and so on. They used to display examples of their prints for others to see what was available. Maybe you would have such a place there too. It would be quite a good way of advertising if people who were going in to get print work done anyway could also see your work available. You might even be able to work out a deal with the printer in terms of they get the business for the printing, you get the business for your designs. Don’t know how that would work out financially but maybe worth a thought. Also, my brother had a photography exhibition last year at a local civic centre. Wine and a walk around. But he sold quite a bit from his displays. He’s only taken it up in the last few years as a hobby. But now he’s covering football matches for e-zines as well as keeping up with his ‘Glasgow at Night’ theme. The potential is there. It’s just finding the avenues, I suppose. Some of them maybe in unexpected places. A couple of coffee shops here used to allow local artists to display their work on their walls and sell through the coffee shop! Oh, I think it looks perfect as it is. I don’t know a great deal about painting but I know what I like and I wouldn’t tamper with what looks to me like completion! I think what you describe for the background of the black and white sounds amazing. Must be the Scot in me it appeals to. It almost sounds as if it depicts an overcast or wintry day with subdued lighting. With the black and white superimposed it would look great. Like Scots mist rolling in off the seas and over the mountains! I knew it… They are your blue monkeys. I shall round them up and send via Fed-Ex. Thanks for the kind words and suggestions. Very encouraging! I would like to paint one in black and white, with the subdued colours of the photo background – my Payne’s Grey ran out, which is one of my favourite colours. I have some watercolour paper and paintbox, and am going to attempt to create the sea and sky from the photo. I have a good assortment of colours for it. 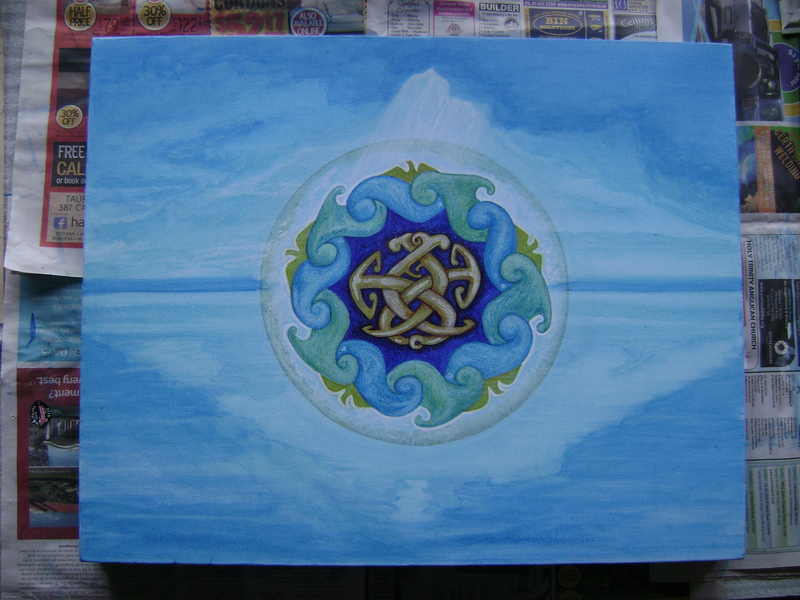 I might wait for a week and see how I feel about the blue painting… It might be that I need a bit of practice with skies and seas first. It’s absolutely beautiful. Now walk away from it. Perfect as it is. That is an incredible amount of work for one picture but it shows. That way you could produce more of the black and white as they must be less time-consuming and have samples of all your designs in colour too. Only having to do more of the colour as and when orders roll in. A page devoted to all the designs in both. Just ideas. They are new colours for me. The ones I would normally use had dried up! I have nothing against you doing what you need… paint away, dear Uncle Art! I may have to get another canvas and start a new one. I’m too worried that I might ruin this one if I do more on it! Right, that does it… I’m going to brave it and go have a look! Thank you – I’m glad you like them! 🙂 Hope you soar like the bird in the pic!